In this sequel to Phu Bai , CID investigator John Murphy travels to a remote U.S. military base in East Africa during the summer of 1968 to investigate the mysterious death of an American soldier. Evidence points to a marauding band of Eritrean rebels. The investigation becomes personal when someone tries to kill Murphy, still coming to grips with his Vietnam War experience. Murphy uncovers the identity of the murderer but faces an unusual dilemma while wrapping up the case. “I finished Kagnew Station on Sunday morning before we headed home, and thoroughly enjoyed it. When you think about it, a good novel is even more relaxing than a hot tub, because you can enjoy it a lot longer.” Read complete review here. 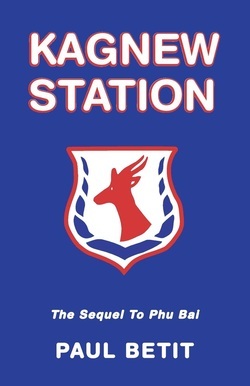 "Like Betit's earlier book, Phu Bai, Kagnew Station is a very good, fast-paced read. I recommend it to everyone who loves suspense and mystery." "A really great book with a plot you can understand and enjoy the intrigue of a potential tryst. The story takes place in some far away places and has enough detail in the story line and the locations to make it believable." "This is a really great book to read if you like detective stories ... Kept me in suspense all the way. Couldn't put it down until I finished it." "Why this book hasn’t been made into a movie yet is anyone’s guess." —Clark G. Davis, Collinsville, Ill.